I was first introduced to this delicious dish through one of my friend Schwartz. 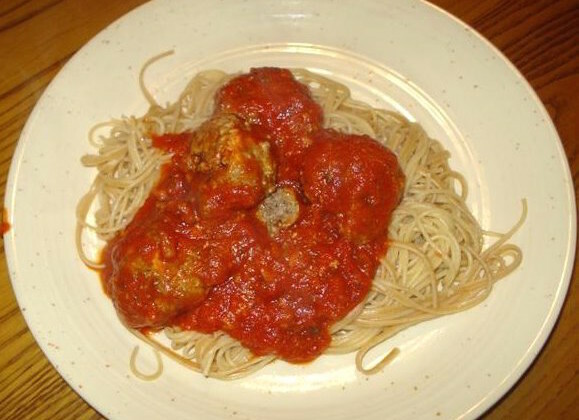 Growing up my mom never made meatballs to accompany spaghetti; instead she would just add browned burger to the sauce. This was good, but this was all I knew. My spaghetti life changed once I had a meatball. I learned how to make meatballs from him. I asked him for his recipe and it went something like this: hmm, you need bread crumbs (cracker crumbs work) the ones with Italian seasonings are great, eggs, and Parmesan cheese is nice. He didn’t know the amounts, he said he goes by feel and smell. Well thanks Schwartz! My first attempt was no where near the tastiness of his, but I have been practicing and I think tonight I came up with a dang good recipe. Leftover pesto was the inspiration for these tasty meatballs. Add all ingredients to large bowl, mix well with your (clean) hands, add more breadcrumbs if mixture is too wet. Hand roll into golf ball size meatballs. Place into 9X13 in. pan, bake 25 minutes.